This week’s Parasha begins with specific instruction on the arrangement of the lamps within the tabernacle according to the “pattern which the Lord had shown Moses” (Num 8:4) followed by the cleansing and dedication of the Levites for service within the Tabernacle. The Lord declares: “you shall separate the Levites from among the children of Israel, and the Levites shall be Mine” (Num 8:14). The Levites were specifically called out by the Lord as a substitute for the human firstborn of the Israelites and set apart to carry out the holy role of priesthood within the Tabernacle. Following this, the Lord gives more instruction on the feast of Passover. There is then a literal description of how the Israelites moved, following the cloud by day and the fire by night (what an incredible picture!). To move a vast group of people was not simply a case of getting up and going, but very specific and practical steps were needed. Numbers 10 describes how two silver trumpets were used to rally the Israelites for different purposes. In Numbers 12, Aaron and Miriam speak against Moses, culminating in the Lord Himself descending in a pillar of cloud to specifically endorse Moses saying that “He is faithful in all My house. I speak with him face to face…” (Num. 12:7-8)! A similar occurrence takes place in this week’s reading in the book of Zechariah. Joshua the High Priest is accused by Satan and then acquitted, protected and charged by the Lord Himself. Following this, an Angel continues to talk with Zechariah and explain the vision of the lampstand and olive trees. This truth is affirmed by the Apostle Paul in 2 Timothy 3:12 where he says that “everyone who wants to live a godly life in Christ Jesus will be persecuted.” Perhaps this is not a promise to stick on a fridge magnet, but yet it contains great encouragement to fortify the believer for the purposes of God! Accusation and persecution are sure to come. This can sometimes come in the form of a brother or sister speaking against us, as in the case of Moses and Aaron, and sometimes come in the form of spiritual warfare, as in the case of Joshua being accused by Satan. Yeshua adds that a primary point of persecution will come from the world. What matters is not how the trouble arises, but in how the believer responds. 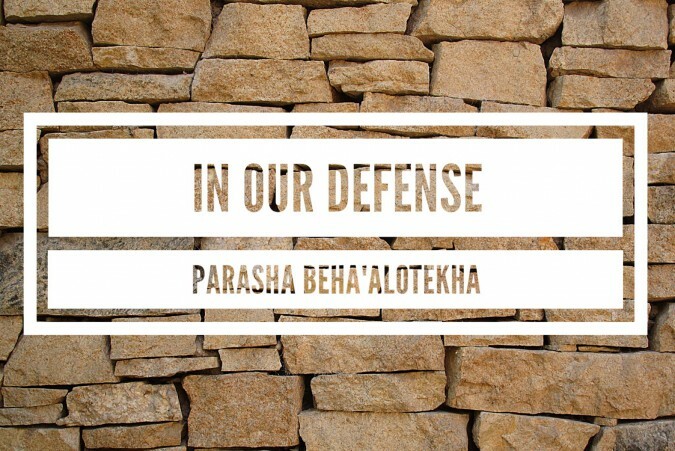 In every case of this week’s Parasha the Lord Himself intervenes and stands up for those He has chosen. We can be inspired to confidently affirm “who will bring any charge against those whom God has chosen? It is God who justifies, who is he that condemns?” (Romans 8:33-34). We have this confidence in Messiah to know that there is One who stands on our behalf, intercedes for us, works for our good and is in the process of turning every test into a testimony. In the midst of trial we need not plead our own cause but can entrust our defence to our heavenly Advocate, and allow Him to intervene on our behalf. We extend this same truth to the nation of Israel today. While there are many speaking against those whom God has chosen, there is One who stands in their defence. Israel is called out from amongst the nations (just as the Levites were from amongst the Israelites) to be a blessing on the Earth. God defended Moses from accusation about His right to be a leader and we know that God is defending Israel in the very same way. Just as Satan stood to accuse Joshua, we know that the Lord takes personal responsibility for His people and is committed to their redemption in Messiah. We pray that Israel would not seek salvation in military might or political aptitude, but that they would seek the God of Abraham, Isaac and Jacob, to step into the testimony of Joshua the high priest as the Lord intervenes!